Mary Magdalene, First Apostle, is an inclusive Roman Catholic community where all are welcome. We support the ordination of women and stand for justice and equality in the Roman Catholic Church. 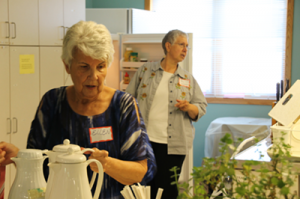 Pastored by Roman Catholic Womenpriests of the Midwest Region, we serve the St. Cloud, MN, area. RCWP is at the forefront of renewal in the Catholic Church, advocating a new model of priestly ministry, united with the people served. It is rooted in response to Jesus of Nazareth, whose ministry and teachings included women, men, and all kinds of people without regard for status or social acceptance. We are filled with gratitude for the hospitality from St. John’s Episcopal Church and their clergy, Rev. Priscilla Gray and Rev. George Ham. Besides using their church spaces and seating, we use their altar, their organ and piano, their sound system, and their kitchen. The graciousness of St. John’s Episcopal makes possible our ministry and mission. Central to the mission of Mary Magdalene, First Apostle, is inclusive language—references to our Creator/Source in terms that include the feminine so that God does not seem to be a god. At the beginning of Mass our presider says as we make the sign of the cross, “In the name of God our creator, Jesus our brother, and Holy Spirit Sophia.” We profess belief in multiple revelations of God and pray to the Beloved, the Gracious and Merciful One. We attend to the teachings of Jesus, our brother. Participants at our services appreciate the reflective doors of consciousness opened by our diverse images. In September of 2011, Bishop Regina Nicolosi blessed Mary Frances Smith as the pastor of our community. On June 23, 2013, Mary Magdalene, First Apostle, hosted the ordination of three women to the priesthood, including Bernadyne Sykora, who spurred the founding of our community. Mary and Bernie now serve as co-pastors. 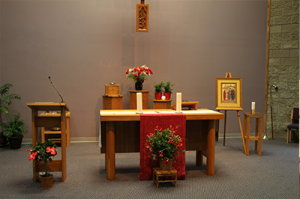 We began having Roman Catholic womenpriest Masses in December of 2009. 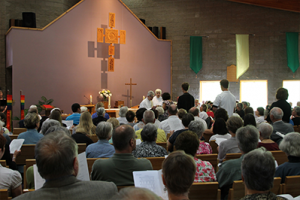 Since November of 2010, our community has been celebrating Mass every second Sunday of the month at St. John’s Episcopal Church. A social with snacks follows Mass and often a forum on topics of interest to our inclusive community. All are welcome. 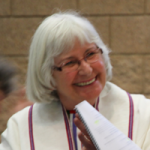 Most photo images on this website are by Katy Mae HLN, a member of Mary Magdalene, First Apostle.